“Chicago’s Picasso” is said to be the most consequential sculptural installation in Chicago. This post is about examining the widely accepted notion. Its significance can be evaluated by analyzing its impact on sculptures, sculptors and public policies. Untitled – by Herbert Ferber. Before discussing the aftermath of Picasso’s sculpture, first a bit about the sculpture. Picasso’s Chicago is one of the first modern monumental sculptures to be placed outdoors in the Loop. It was unveiled in the Civic Center Plaza [now the Daley Center Plaza] on August 15, 1967. It is fabricated of “Cor-Ten”, weighing 162 tons, it stands 50 feet tall. Picasso designed a 42-inch model of the sculpture. He was offered payment of $100,000 for the work, but he refused to accept the payment, stating that he wanted to make his work as a “gift to the people of Chicago.” The artist, Pablo Picasso left it untitled, but Chicagoans named it after the artist, calling it the “Picasso”. The actual sculpture was manufactured by United States Steel Corporation in Gary, Indiana, where it was entirely pre-assembled, then disassembled, and subsequently shipped to the Daley Center to be reassembled in its final form. The sculpture was initially greeted with lots of controversies. At the time of its installation in 1967, the abstract design, the non-traditional materials and huge scale were all subject of scorn and ridicule. Art scholars have suggested that the statue is either a portrait of Picasso’s wife at the time, or his Afghan dog from different angles. Some even interpret it as a horse, a baboon or a Viking Ship. Now it is accepted as a cultural identity of Chicago. Here is examining a few developments that took place after its installation. Picasso’s Monument Sculpture at Daley Plaza, was Not the First monumental abstract sculpture in Chicago. First it is important to note that “Chicago’s Picasso” is not the first monumental abstract sculpture in Chicago. The first abstract sculpture by a contemporary artist to be put at a public space in Chicago was in 1958 in the lobby of Inland Steel Building. It was the work of American artist Richard Lippord titled “Radient One” click here.... Another abstract installation was in 1964 at the University of Chicago by Russian Constructivist artist Antoine Pevsner named, “Construction in Space and in the Third and Fourth Dimensions”.. click here.. There was also Cubi VII by David Smith.. click here.. But Picasso was the most famous and influential artist of his time, and his installation has widespread impact! Although Picasso’s Sculpture was not the first abstract monument in Chicago, but arguably it was the most influential. Picasso was the most famous and influential artist of his time. His installation had widespread impact! 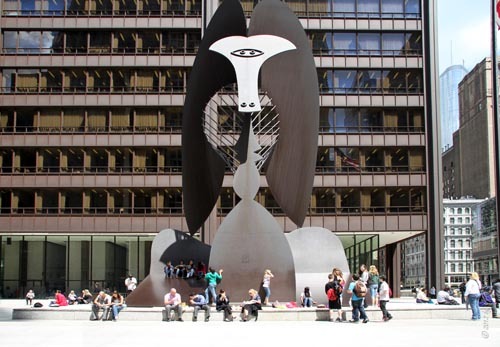 Soon after the installation of Picasso’s monumental sculpture at Daley Center plaza; Chicago saw a proliferation large scale sculptures in outdoor public spaces. These new installations had something in common – these were modern sculptures – representing emerging styles in cubism, surrealism, pop-art, abstract expressionism and conceptual art. Also, most of these were non-commemorative. Although commemorative sculptures are part of the fabric of our culture and tell stories of our rich past. But these are more about history and less about art. Modern sculptures were more in line with the philosophy of art for art’s sake. The installation of Chicago’s Picasso heralded a new trend of modern, abstract, non-commemorative outdoor sculptures, a perceptible shift from sculptures prior to 1967 which were mostly figural and commemorative. 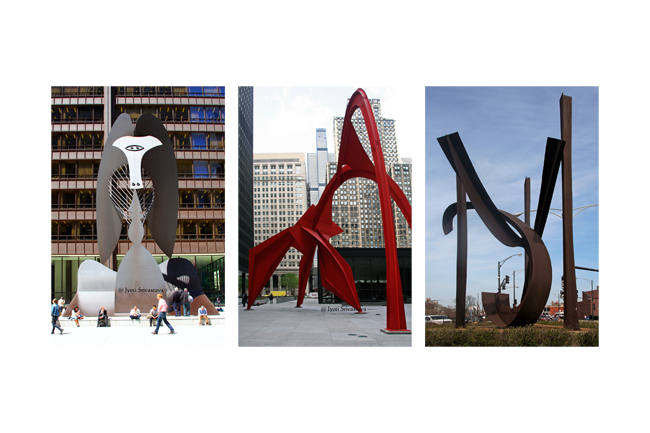 Within two decades of Picasso’s installation, Chicago saw a large number of monumental outdoor installations: Herbert Ferber’s Untitled , Alexander Calder’s “Flamingo” , Marc Chagall’s “Four Seasons” , Harry Bertoia’ s “Sounding Sculpture , Isamu Noguchi’s Fountain, , Claes Oldenburg’s “Batcolumn” , Henry Moore’s Sundial , Joan Miro’s Chicago , Louis Nevelson’s “Dawn Shadow” , Jean Dufuffet’s ”Monument With Standing Beast”, and Sol Lewitt’s “Lines in Four Directions”. 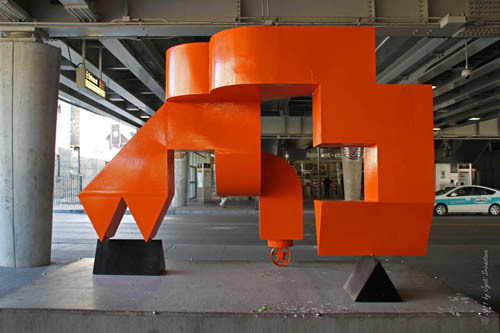 [II] The Trend towards modern abstract sculptures was not isolated to Chicago. It was an international trend. Modern Abstract sculptures which were earlier seen in select art galleries were increasingly being installed in public spaces. But in Europe, after the Second World War, many sculptors were producing abstract figural, like Henry Moore, Marino Marini, Alberto Giacometti, Germaine Richier and Jean Dubuffet. However in Chicago, we see preponderance of abstract non-figural sculptures. Another trend contributing to modern abstract outdoor sculptures was the increased popularity of International Style architecture with glass curtain wall. This led to the decline of decorative elements in the buildings which were an integral part of the Beaux Art architecture. Now decorative elements were installed in outdoor settings and the style was usually modern sculptures which goes well with the modern architectural style. Another significant aftermath of installation of Picasso’s monumental sculpture, was that it brought to Chicago many prominent sculptors of national and international fame. Within two decades of its unveiling, Chicago had permanent outdoor installation by many modern sculptors: French Marc Chagall and Jean Dubuffet, British Henry Moore, German Hubertus von der Goltz and Italian Ludovico de Luigi. 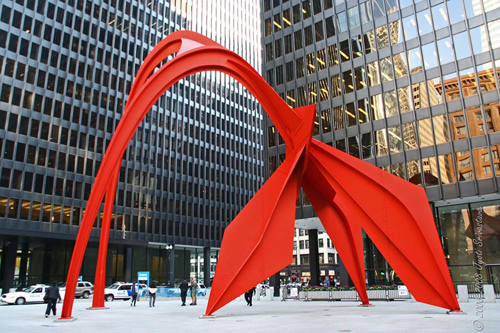 Many prominent American sculptors also had installation in Chicago, Alexander Calder, Claes Oldenburg, Herbert Ferber, Mark di Suvero, Ellsworth Kelly, Isamu Noguchi and Louis Nevelson. Although this was not the first time that Chicago had attracted many illustrious sculptors. The World’s Columbian Exposition of 1893 had established Chicago’s name on the national stage. However, having Picasso’s largest monumental sculpture installed in Chicago, consolidated its reputation in attracting world class artists! Now we have installation by internationally famed sculptors like Jaume Plensa, and Anish Kapoor; but still having installation by Pablo Picasso is perhaps one of Chicago’s greatest assets! It is also important to examine prominent Chicago based producing modern abstract sculptures. In 1968, there was a temporary exhibition in the Pioneer Court called “Eight American Sculptors”. It included the work of five Chicago sculptors: John Henry, Richard Hunt, Jerald Jacard, Edwin Strautmantis and Stephen Urry [apart from two sculptors from New York Mark di Suvero and Michael Steiner and one sculptor from Detroit Michael Hall]. These are few of Chicago’s earliest sculptors practicing modern abstract sculptures. 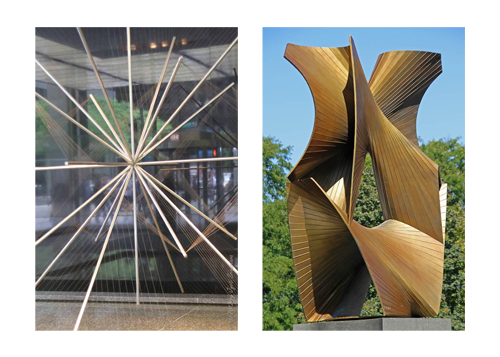 Some of the early modern sculptures produced by Chicago-based sculptors are .. “Space Junction of Energy” by Jerald Jacquard .. click here.. “Slabs of the Sunburnt West” by Richard Hunt .. click here.. Aaris by John Henry .. click here.. Being Born by Virginio Ferrari .. click here.. However was only after 1990s that we see proliferation of work by Chicago-based sculptors like Jerry Peart, Tom Scarff, Terrence Karpowicz, John Adduci, Barry Tinsley, Barry Hehemann, Ed McCullough, Mike Baur, Ron Gard, Mike Helbing, Ted Garner, Ruth Aizuss Migdal, Ivan Lewis, Bill Boyce, Dean Langworthy and Don Baum. [V] Picasso’s Chicago is said to be the grandfather of Public Art program in Chicago. Chicago’s Picasso was installed in the Civic Center [later named Daley Center], which is the public square of Chicago. It is said to be catalyst to the city’s passing of Percent-for-Art Ordinance in 1978. It mandates that 1% [Since 1987, it is 1.33 %] of the construction or major renovation budget of a city-owned or city-financed building or structure or certain outdoor improvements is to used to acquire or install permanent artwork at that site. At least half of the works must be created by Chicago-area artists. The City of Chicago has over 500 works of art created by more then 300 artists. These are spread over 140 public spaces and municipal facilities across Chicago including libraries, police stations, fire stations, office buildings, health plazas and other public buildings. So coming back to the question of how consequential is the installation of Chicago’s Picasso at Daley center plaza..
50 years after its unveiling we have a good understanding of its significant in Chicago’s cultural scene in general and Public Art scene in particular. One can safely conclude that it ushered an era of modern, abstract, non-commemorative sculptures in Chicago, consolidated Chicago’s dominant position in international art scene, attracted prominent national and international artists to the city and has been a catalyst in Chicago’s Public Art program, which has been instrumental in installing art pieces at many public spaces in Chicago! Untitled by Pablo Picasso.. click here.. The Aftermath of Picasso’s Monumental Sculpture at Daley Plaza.. click here.. The Making of Picasso’s Monumental Sculpture for Daley Plaza.. click here..